I love garlic. I am a typical Mediterranean girl and if you try any of my culinary creations, you will realize it quite fast. I put garlic, olive oil and oregano pretty much in everything. Because THEY TASTE AMAZING. Today’s recipe is as simple as it gets. All you need is an oven and 40 minutes patience and then you can enjoy the magic that roasted garlic and onion are. 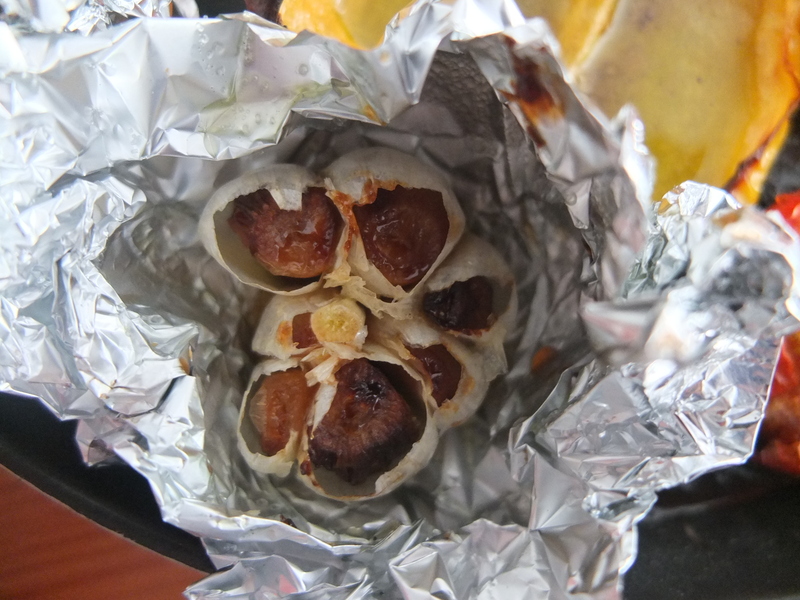 Preheat the oven at 200-220 C.
Peel the outer layers of the garlic, cut about 1/2 cm from the top, massage with olive oil and wrap in aluminum foil. Peel the onions and cut in half or create multiple sections, without cutting through (stop about 1 cm from the bottom). Massage with olive oil. Cut the tomatoes in half and -you guessed it, I am sure, massage with olive oil. Sprinkle everything with salt and pepper and the herbs of your choice. 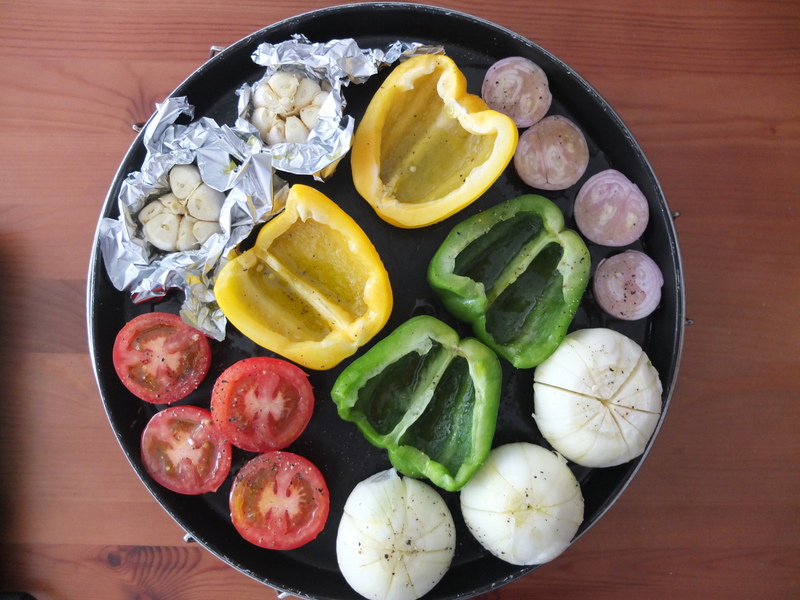 Roast for about 35-40 minutes or until all your vegetables look golden and delicious. 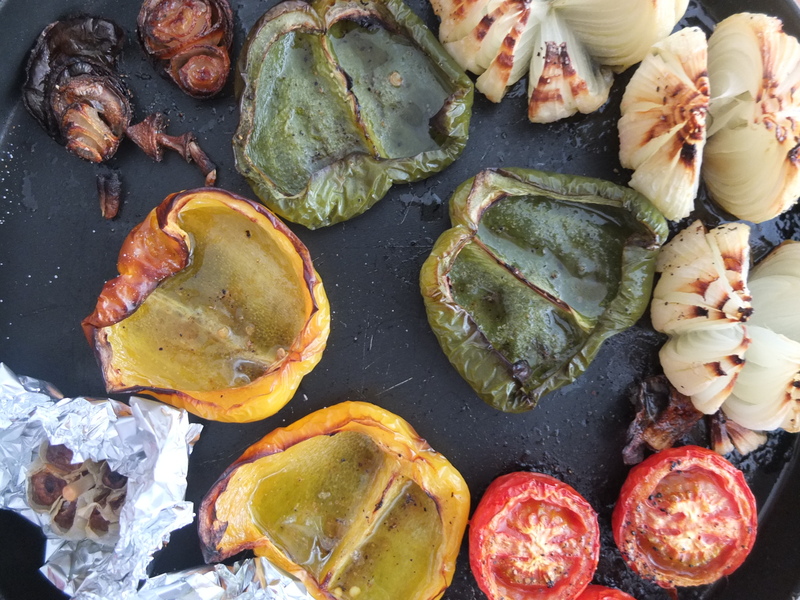 You can eat your roasted vegetables straight from the baking pan as a snack, serve them as a side dish or mash them and make a delicious pasta sauce from them. After. Yes. they shrink but their taste multiplies and magnifies. 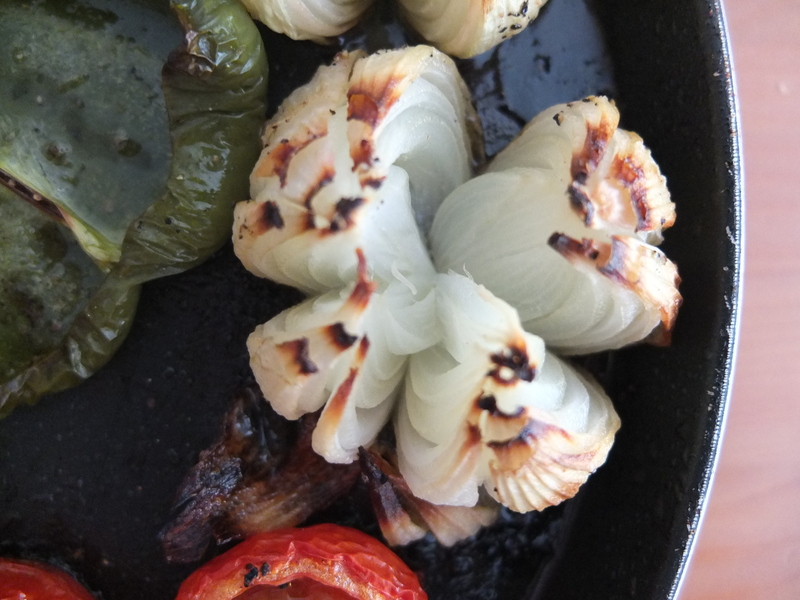 I love how the onion opens up like a flower. It’s sweet, it’s sticky, it’s awesome! In case you are curious, we ate our roasted vegetables with mashed potatoes, because we are lazy like that. Still, one of the best dinners we’ve had for quite a while. P.S. : Now that you are reading this, we are on holidays. I have written and scheduled a few posts, to keep you entertained while we are gone.